European ski vacation is the classic ski experience and every skiers dream. Picturesque historic towns, great slopes, beautiful scenery, fun après-ski, lively nightlife, luxury accommodation and gourmet food. Many countries in Europe are excellent for luxury ski vacations. 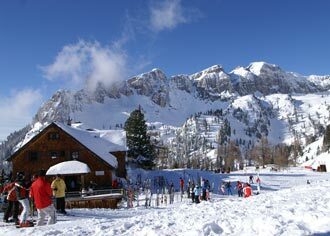 The Alps are world known for its great ski resorts, not least countries like Austria, Switzerland, France and Italy. The Alps are though not the only area for European ski vacation. The Pyrenees in Spain or Andorra are popular skiing destinations and some of the Scandinavian countries, like Finland, Norway and Sweden, are among the best European ski vacation destinations. The Alps are though the most popular choice for luxury European ski vacation so let's have a closer look at some of them. There are many reasons why Austria skiing is among the most popular European ski vacations. The ski resorts are charming with authentic village life, the snow is generally powdery and fluffy well into spring, the weather is pleasant and sunny winter weather, vertical drops of over 4,000 ft. is the norm, the après-ski culture is world know and it is more affordable than most people realize. The Grand Hotel Lienz is a five star hotel in Lienz, East Tyrol, i.e. in southern Austria (near to the Italian border). This picturesque medieval town (population just over 12 thousands) is framed by Austria's tallest mountain, the Grossglockner and the Dolomites. The hotel is surrounded by stunning mountain scenery and offers all the services and facilities you would expect from such a pristine hotel, i.e. luxury accommodation, gourmet cuisine, exceptional services and spa oasis for the tired body and soul. 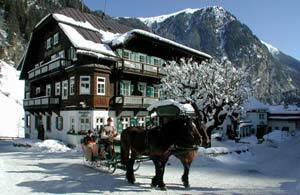 Grand Hotel Lienz is ideally located for Austria skiing vacation. All ski areas in East Tyrol are accessible within 30 minutes by car and one ski pass is valid for all the ski areas. 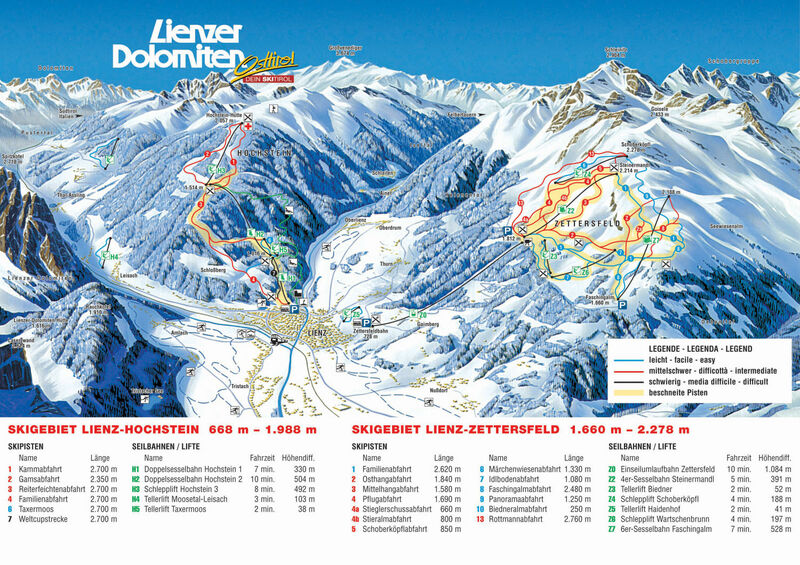 The Lienz Ski Map shows the ski areas closest to the hotel. The Hochstein ski area begins at the edge of Lienz, only five minutes from the hotel and offer challenging downhill skiing directly into town. Only five minutes car journey will take you to the panoramic cable car that takes you to the Zettersfeld ski area with total of 30 km of slopes and is ideal for beginners and intermediate skiers. Hoteldorf Grüner Baum is another excellent choice for luxury Austria skiing vacation. Many of Austria's top ski areas are just short drive away and there is hotel bus that takes you to the 250 km of slopes, ranging from blue to black. 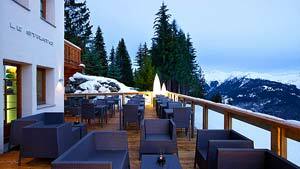 The hotel is member of Small Luxury Hotels of the World and is located in the Austrian Alps, close to the Italian border. The hotel and its surrounding ooze of Alpine charm. Each of the rooms feature contemporary alpine decor with wooden balconies, pitched roofs and shuttered windows. There is swimming pool and beauty centre and first class dinning on offer. Hoteldorf Grüner Baum offers authentic Austria skiing experience. Swiss ski resorts are world famous, who has not heard about the rich and famous skiing in St. Moritz. However, there are ample of luxury ski vacations on offer in this small but mountainous country. 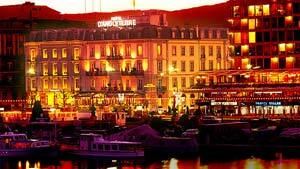 If you want to combine city break and luxury ski vacation then Geneva might be what you are looking for and the historic hotel d'Angleterre the right hotel for you. Hotel d'Angleterre , a member of the elite Leading Small Hotels of the World, is located at the edge of Lake Geneva and enjoys stunning views of Mont Blanc. The hotel offers blend of old world charm, impeccable service and cosmopolitan surroundings... while being only an hour away from some of the best Swiss ski resorts. There are daily skiing tour trips on offer, as well as several busses and trains daily to the neighboring skiing resorts. Many hotel guests prefer to rent a car that allows them to get to the Jura Mountains in France within half an hour, or to the VIP Swiss ski resort of Gstaad. France ski vacation is one the finest European ski vacations on offer and France offers huge variety to skiers and snowboarders. Some of the steepest slopes are in France and the Three Valleys offer miles after miles of superb skiing. Courchevel offers one of the largest linked ski areas in the world, i.e. the Three Valleys. Over 600 km of prepared and maintained slopes, half of them easy (greens and blues) and the other half advanced (reds and blacks). This means less time queuing for ski lifts and more time for skiing. Majority of the runs are located above 1,800 meters ensuring optimal snow conditions from the beginning of December to the end of April. All this makes Courchevel a great choice for French ski vacation and Hotel Strato makes this one of the ultimate European ski vacations on offer. From the outside Hotel Strato looks like the perfect classic Alps getaway while the inside is an innovative mixture of contemporary fittings and historic items. The look is tranquil and stylish and the service and amenities are exceptional. The rooms are beautifully finished, with views over the breathtaking beautiful valley and each room with balcony or terrace. Hotel Strato is a wonderful oasis to retreat to after busy day skiing and is the perfect base for luxury European ski vacation. Luxury ski vacations tend to come at a price. Luxury Link travel auctions allow you to bid on luxury holidays. If you are successful, you could secure luxury ski vacation for the fraction of the retail price but travel auctions usually start at up to 65% off retail prices. Bear in mind that placing a bid is a commitment to purchase the package if your bid is accepted. Auctions are also nonrefundable. Luxury Link fixed price Buy Now Deals can also secure you a great discount from the retail price. Luxury Link offers all the accommodation mentioned in this article. Ps. check out our Top 10 Ski Travel Tips.